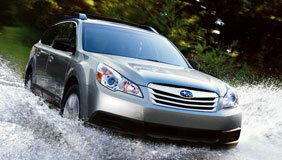 Subaru has announced the Outback will be getting a mobile Wi-Fi option. The option will enable the vehicle to have mobile, uninterrupted 3g internet access while the vehicle is moving. The Outback will serve as a Wi-Fi hotspot, allowing any Wi-Fi enabled device to connect and allowing the user to browse the internet. The price of the option is $499 and requires a $35 activation fee, as well as a $29 monthly service fee.